Gambhir in Marathi means ‘serious’. 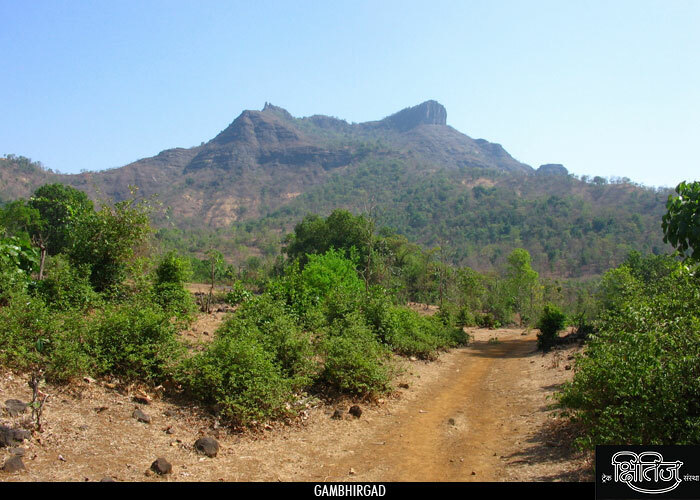 So, Gambhirgad and its environment is according to its name quite ‘serious’. Situated in Thane district and on Gujarat border, it is probably the last fort in Thane district. Approaching the fort, we first reach the plateau which is the machi of the fort. It has lot of uncontrolled growth of wild plants. There is nothing much to see on the machi. We take right from here to reach top of the fort. We come across a beautiful water tank along this way. The water is usable but a rope is necessary to take it out. Moving further, we reach stairs. The climb further is such that we have to move with a cliff on our right. It takes around 15 minutes to reach the top. On exploring the fort of right side, we see remnants of some construction. There is also a temple of a goddess. Also we have 1-2 water tanks buried under soil due to erosion. Other than this there is not much to observe. We return to explore remaining part of the fort, on the left. One can certainly see evidences of now extinct curtain wall. We climb down by this side. On way down we come across 2-3 water tanks. Some small pinnacles on the way also grab our attention. One and half hour is enough to explore the fort. Mahalakshmi pinnacle and forts namely Asheri and Adsul are visible from this fort. From Kalyan or Wada reach Manor fata. From here get some transport to Charoti on the way to Ahmednagar. There are two ways from here, one leading to Ahmednagar while other leading to Nashik via Javhar. Take one leading to Nashik to reach Kasagoan around 2 km away. It takes 8 km to reach Aslon from here. Reach Bhoisar via Mumbai – Palghar road. From Bhoisar we have ST buses to reach Kasagoan. Further we reach Aslon as explained earlier. From here, it takes 3 km to reach Patilwadi. This is the base village. Further we have to move rightwards with the fort on our left. After one and half hours climb, we reach to the plateau. From here we take right to approach the fort. Drinking water is available in the tank but rope is necessary to take it out.